Full of character and charm this three-bedroom Mud brick home is built on an 887m2 allotment, walking distance to the Train station and bus stop with magnificent views across to the Kinglake ranges and beyond. The third bedroom is suitable for home office, studio or separate living. The double lock up garage, open bitumen parking spaces and side access to the rear of the property would make this property ideal for a trades man requiring storage and parking facilities. With three bathrooms, large open plan kitchen/meals/ dinning and lounge and outside entertaining this home will be well sought after. Freshly painted inside and out, with new carpet; this home has been lovingly renovated with the focus on light and warmth. It features vaulted ceiling and balcony bathed in sunlight from the skylight windows (remote control blinds), limewashed walls and ceilings and light-coloured walls which bring out the charm of the mudbricks. The large open plan kitchen / living area features a Euro wood heater, slate floors, tastefully decorated kitchen with new stainless-steel appliances and plenty of storage. There is a family bathroom on the main floor, toilet, and laundry with plenty of storage. As you venture up the central stairs you find two very generously proportioned bedrooms at either end of the balcony which share a bright modern en-suite. 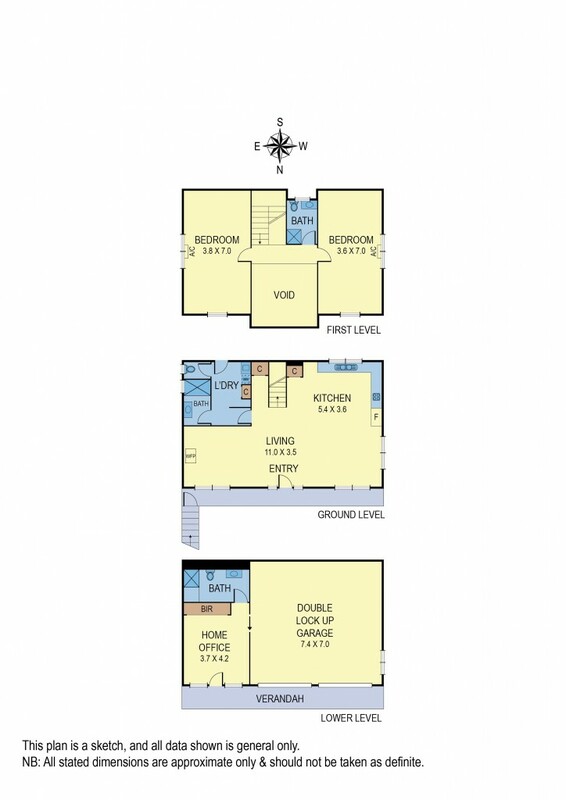 The lower level consists of the studio/home office/bedroom with its own modern en-suite, separate entrance and access directly into the garage. Ideal for working from home or guest accommodation. The front and back yard are low maintenance native gardens. In the fully fenced backyard there are four vegetable patches, garden shed, landscaped donnybrook paths and fire pit area for entertaining along with a deck at the rear of the house. Features of this property include: New carpet, ceiling fans, split systems, European wood fire, DLUG, side access to the rear of the property, garden shed, freshly painted throughout, new rangehood, oven and gas cook top and much more.